SysKit nailed it right on the head when they called their new SharePoint Monitoring product, Insights! If you liked SPDocKit, you will absolutely love SysKit Insights! 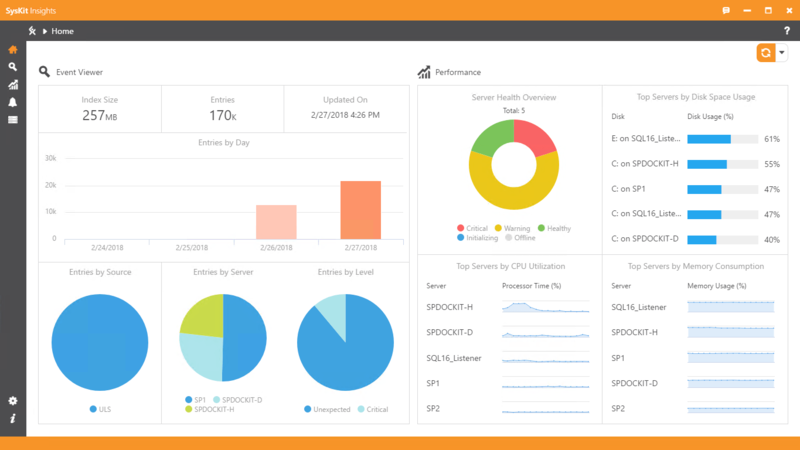 From the creators of SPDocKit, comes one of the best SharePoint monitoring tools yet to hit the market, SysKit Insights. The name of the product “Insights” is spot-on, accurate, as once you have it installed and up to speed, it gives you insight into your farms, servers, or server, depending on the license you’ve purchased. It is a proactive monitoring solution that allows you to stay out in front of your SharePoint servers, versus a re-active tool that only reports after things have already blown up. The product requires a SQL server, and it is possible to install SysKit Insights right on the dedicated Windows Server that runs SQL server which is not a member of your SharePoint farm. For ease of install, I used the SharePoint Farm account to perform the install of SysKit Insights. Make the SharePoint Farm account a local administrator on that machine and give it db_creator and security admin on the SQL server roles, even though the documentation from SysKit says all it needs is db_datareader on the SharePoint Config DB, I wanted to make sure that the account I was using would work for certian. Once those two things were in place, the install process is basically a nexting process, where you input the name of your SQL server and if you have any SQL hardening going on, then of course you need to specify that port either in your cliconfg.exe alias or in the database configuration wizard via one of the formats mentioned on the install guide. If you are in a hardened environment, you need to be sure you can telnet on port 7890 to your SharePoint servers and SharePoint SQL server, or you can change that port to a different numbered port if your security team does not allow traffic on that port for some reason. Now that you’ve got the binaries installed, it’s time to activate your product, just follow the online or offline instructions available at this page: https://docs.syskit.com/insights/v1/installation/installation-guide/. If you’re in a super secure environment, you might need to use the offline method to get your product key registered and generate a license file that you can then import into the application. You might be wondering if the 30 day trial version is for some reason a watered down, not full flavored, version. The answer is no, it is a full version! It is just that after 30 days, the trial version will lock unless you buy a license for the servers that you’re monitoring. Now, you don’t need to install this on a server; but, if you want optimal performance, then the old adage of “you get what you pay for” applies in this regards; since, servers do not go to sleep. Some people have installed Insights on a laptop and then when the laptop sleeps so does the metric recording. As far as getting what you pay for, the old adage does not apply in that you get way more than you pay for when it comes to performance and pro-active monitoring. In other words, you’re getting a ferrari at raw materials cost vs some other monitoring solutions, which are ferrari’s 3 days new on the dealership floor prices. SysKit stands up against the likes of other products that perform diagnostic monitoring and the best part is it is totally separate from your SharePoint farm, so the metrics are accurate. True you can do that with other solutions, but those other solutions still have a SharePoint solution that is deployed to the farm. SysKit is agentless in that it monitors your SharePoint farm; but does not require you to install anything into your farm to do so! Pricing???? Beats most – – Check out these prices and compare them with other monitoring solutions. When it comes to what the insights can do, you’ll be blown away. Take a gander at the Getting Started blog post on the SysKit blog and you will see that the interface is an easy to learn, low curve, interface that provides “insight” into all the logs from a single pane of glass! You can search through ULS logging, SQL logs, and Windows Event Viewer for specific text that you provide in your query. But, that is only the beginning, you can set up alerts that are based on metrics that you can define and then get emails when the server goes above or below the threshold. The email can be sent to an individual or a group. And the sky is the limit on what you can monitor! But don’t take my word for it. What I’m trying to say is that I definitely urge you to check this product out and take a look at all the product and all the documentation that is already published about it and the other products in the SysKit family of products. The Security Manager can also handle Office 365 permissions, as well as your On-Premise SharePoint or HyBrid farm. The user interface is easy to use from what I’ve seen thus far and everything is just so intuitive, without having layers and layers of unneeded complexity. These two products are concise and clear and make administration of SharePoint and Performance Monitoring a breeze! Well, in closing, I hope I’ve peaked your interest and that you’ll go out and download a trial copy and give it a test drive! I might do some videos on it and post them to YouTube or maybe write a more detailed whitepaper in the upcoming month. But, for now, I’m going to jump back into my farm and kick the tires a bit more! Just wanted you to be aware of this product, in case you hadn’t heard of it. Get a trial copy now and hold off on any other product renewal or purchase until you see SysKit Insights and Security Manager!